Luther Burrell believes Saints righted a few wrongs in Saturday’s superb 27-23 win at Harlequins. But he knows he and his team-mates can’t get too carried away as they continue the scrap for a top four spot in the Aviva Premiership. Burrell was one of three Saints try scorers as they secured a stunning victory at The Stoop, with Ben Foden going over for a dramatic match-winning effort. The full-back picked the ball up after Ben Botica failed to boot it out, which would have sealed the win for Quins, and eventually finished a flowing team move. 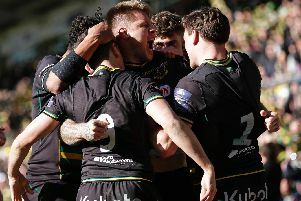 It meant Saints had bounced back in style from the disappointing defeat to Wasps eight days earlier and they are now seven points behind fourth-placed Quins in the standings. And Burrell, who produced a fine display at outside centre, said: “I think we’ve put a lot right. “We played some good attacking rugby, varied our game pretty well and the centre partnership with me and Harry (Mallinder) went well. He really stood up today and was very good. “Ben Foden at the back was very good, Lee Dickson coming in and skippering the team was very good. “When our forwards give us a good platform like they did, we’re going to score some tries on a fast track. Burrell feels Saints’ character and durability shone through at The Stoop. And he also had some words of praise for young centre partner Harry Mallinder, who had a huge influence at 12. “You talk about playing for 80 minutes and that game was the ultimate example of that,” Burrell said. “We’re very fortunate that Botica didn’t get that kick out on the full and we were able to counter-attack. “Foden was excellent, bringing the ball back in and we managed to regather the ball and finish it off. “It was a frantic game and the boys are pretty proud of that. “It’s a tough place to come, they’re a team who are on good form and they’ve got strength in their team with internationals away.